Army Staff Sergeant Luke Murphy (Gamma Eta–Florida State ’09) was the Squad Leader of an 11 man Reconnaissance Team with the 187th Infantry Regiment, a component of the 101st Airborne Division, on his second deployment when he lost his right leg above the knee and severely injured his left leg in an Explosively Formed Penetrator (EFP) blast in Sadr City, Iraq on April 25, 2006. While leaving Sadr City at one o’clock in the morning after searching through a landfill area where bodies were reported to be buried, SSG Murphy was riding in the second vehicle when a bomb detonated after the vehicle’s bumper crossed a garage door opener laser. Four shape charge explosives simultaneously ripped through the armor of the vehicle, seriously injuring those inside; SSG Murphy’s right leg was traumatically amputated, his left leg blown in half. With the brake line severed, and the transmission disabled by the blast, the vehicle continued traveling down the road; fire heating the interior and exploding the ammunition. SSG Murphy instructed the driver to crash the vehicle in an attempt to save those inside. Trapped in the wreckage, SSG Murphy forced open his door, shouldering it off of its hinges. Falling to the ground, he began low crawling away from the truck. While 50 Cal rounds were detonating and with flames all around, the driver of the vehicle began a valiant attempt to save Luke’s life. Thinking his squad leader was still in the truck, and risking his life to attempt entry, the driver finally was able to hear Luke yelling to him, alerting him that he was out of the vehicle and needed medical attention. Dragged to safety and with tourniquets applied by the Medic and his team, Luke started drifting into an unconscious state, visions of his mother filling his head as his team tried to keep him awake. Transported by truck, and thanks to the lifesaving measures by his men, 18 minutes after the blast SSG Murphy was in a field hospital being prepared for medevac to the Baghdad ER where he received several units of blood. Stabilized for transport to Landstuhl, Germany, SSG Murphy arrived at Walter Reed Army Medical Center within days of his injuries and remained there for a year enduring nearly thirty surgeries. SSG Murphy is grateful for the support he has received from the Tallahassee community. Luke enjoys being outdoors and enjoys outdoor activities such as gardening, hunting, fishing and all things in nature. A graduate of Florida State University, Luke enjoys attending FSU Football games and cheering on his alma mater. 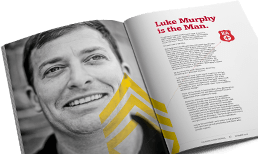 A real estate agent and a nationally recognized motivational speaker, Luke also works with disabled veterans, sharing his positive attitude and helping others to transition to their new normal. Since moving into his home in February of 2014, Luke has become a partner at Southern Land Realty, coauthored a book “Blasted by Adversity” and joined Homes for Our Troops’s Veterans Action and Advisory Team (VAAT). Luke has also endured three more surgeries and says his home has made the recovery so much more bearable. “My home is truly the only place I can move freely and in total comfort. It has been a wonderful place to heal, grow and move forward. I will always be grateful to HFOT for building my home, which empowered me to rebuild my life,” he says.